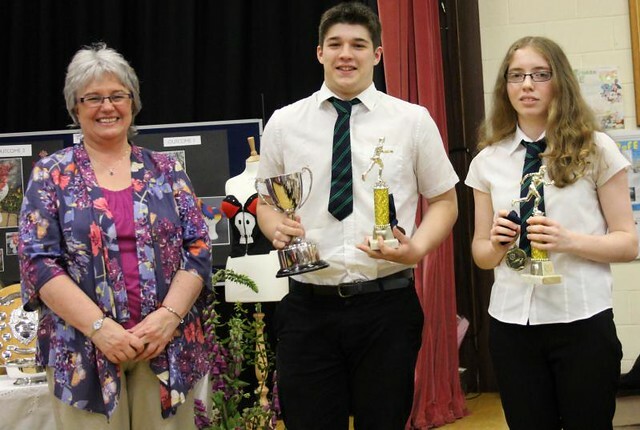 Click here for the names of the Athletics champions previously published. All S1 were presented with John Muir Awards achieved as part of their SMART Course. A number of pupils from S1- S4 were awarded certificates of Personal Achievement. Joseph Smith – also for the second year running. House Credits – All the different competitions that take place during the school year contribute credits towards the House Championship. However a significant proportion of the total credits are earned for their houses by individual pupils throughout the year. 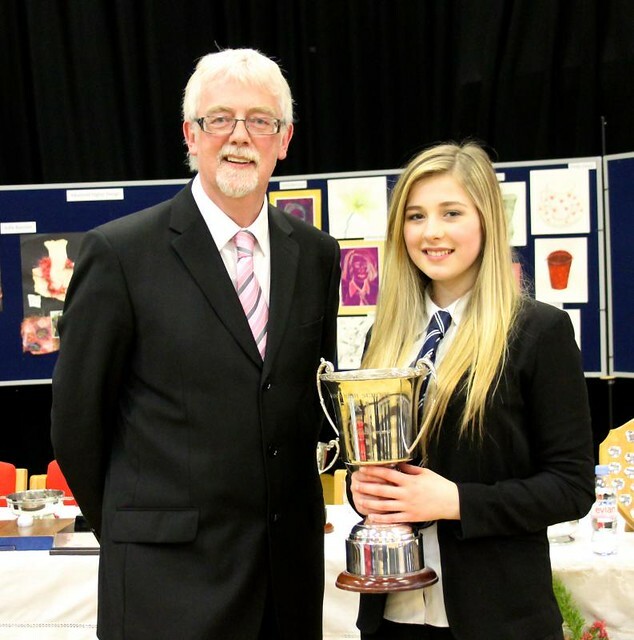 This year, we have a brand new trophy for the pupil who wins the most credits, the Credit Quaich. 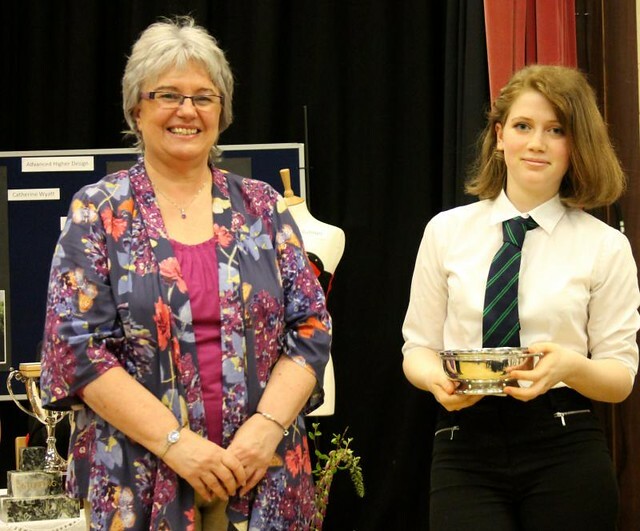 In joint third place, with 29 credits each were Nadia Fenton for Tollaidh and Sara Johnston for Maree. In second place, with 30 credits is Iain Nelson, also Maree. Just one credit ahead, with 31 credits, the first winner of the Credit Quaich is Eilidh MacDonald of Kerry. The pupils with the most credits in each year were in S1, Nadia Fenton, in S2 Scarlet Pickering, in S3 Eilidh MacDonald, in S4 Eilidh Johnston, in S5 Charlotte Kelman and in S6 Holly Morrison, so congratulations to all of them. House Shield – The winning house gained 411 points, the second placed house 372 points and third place was 327 points. The winners of the House competition 2014-2015 are Maree. During Prizegiving the new senior prefects were announced and presented with their badges. Details are available here. In the Headteacher’s speech, Mr Port mentioned and thanked those staff that have either retired this year or are moving to new jobs. Mrs MacLeod, Ms Leitch, Mrs Newman, Mrs Campbell, Ms Mackison, Mr Avenel and Mr Johnston. All will be missed. Mr Port also welcomed new staff Miss Smith (Geography) and Dr Brindle (English). The appointment of a biology teacher is currently underway. Mr Port once again gave his thanks to all the school staff for their unstinting dedication to the pupils and the work of the school. 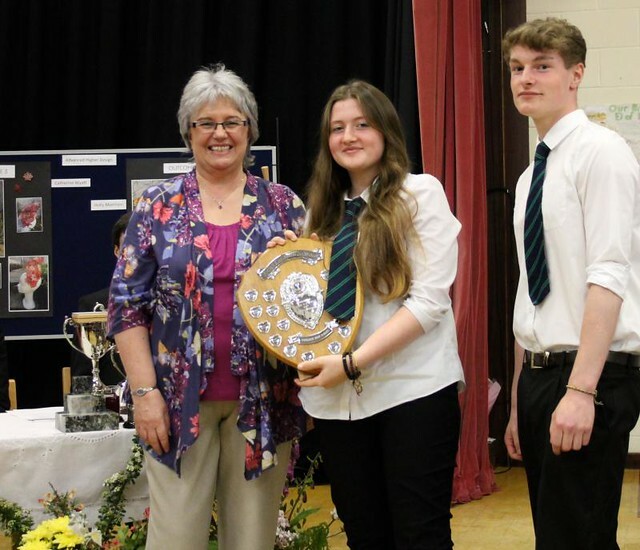 Ms Mackison was presented with flowers as thanks for presenting the prizes and Dr Caley also received flowers in thanks for organising the event. All photos were taken by Miss Hunter. 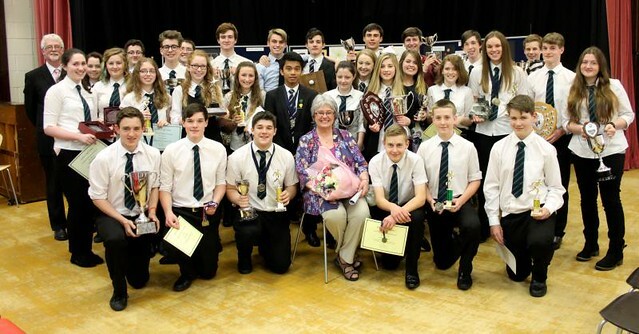 A large number of photos of award winners can be seen here on the website. You can watch the 5min slide presentation review of the year on Facebook by clicking here.